Bridging will enhance your Youth and Young Adult Ministry programs, and help make the process of becoming a young adult a spiritually fulfilling community event for your congregation. The Bridging ceremony is an important milestone, not only in the life of an individual, but also in the life of a family and a faith community. This resource offers a blueprint for a year-long program marking the transition from youth to young adulthood, and for ceremonies commemorating this transition. It invites parents and caregivers to express their support for the young person's journey while acknowledging the significant changes and feelings the family experiences when a young person moves into adulthood, and offers the congregation meaningful advice on supporting youth on the cusp of young adulthood. 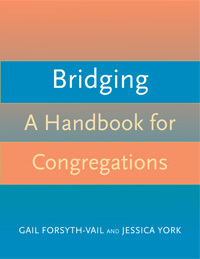 Bridging will enhance your Youth and Young Adult Ministry programs, and help make the process of becoming a young adult a spiritually fulfilling community event for your congregation.